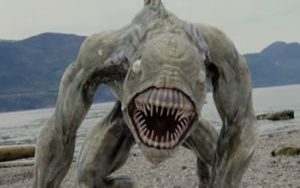 The 2008 monster flick, Sea Beast, originally titled Troglodyte, is one of many films in the SyFy Channel’s “Maneater” series. With titles such as Grizzly Rage, Rise of the Gargoyles, Sand Serpents, Roadkill, and Blood Monkey, the series covers just about every myth, legend, no-legged to multi-legged creature, flying/swimming/crawling creature, and anything else determined to chow down on humankind. These are low-budget, direct-to-TV/video productions that make no apologies for their cheesiness—or should I say semi-cheesiness, for I’ve seen a lot worse in this genre, and I’ve tuned out of many in ten minutes or less. So why single out Sea Beast? 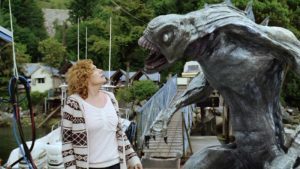 Well, unlike so many creature features that think they have to be funny or cute, this film takes itself a bit more seriously—even though some of the special effects might cause a chuckle or two. Here is a brief overview, with no spoiler alert. With the above tagline we join fisherman Will McKenna and his crew at sea as they deal with a thunderstorm. An invisible creature appears (that sounds weird) and pulls one of the crewmen underwater. We only see its outline. It then hitches a ride to port on the bottom of the boat. Two of the crewmen, Danny and Drew, plan a weekend in a cabin on a nearby island with their girlfriends, Carly (Will’s daughter) and Erin. Drew stays behind to finish up some work and says he’ll join them. He soon becomes lunch for the creature. Will and biologist friend Arden find Drew’s arm in the water, along with some green slime—the same that Will had found on the boat. On the island, Erin sits on the beach and waits for Drew. The monster shows up, paralyzes Erin by spitting the green slime, then has another snack. Unaware of Erin’s fate, Danny is gathering firewood nearby when a smaller version of the creature appears and bites him on the hand. You don’t want to know what that hand looks like as the story moves forward. Will and Arden hunt the creature. Now, small creatures appear all over the mainland, and the humans start dropping like flies. Two young people die as Will and Arden look on, and later an entire hunting party that was organized by the town’s sheriff—Will’s brother. Arden has a theory, and to prove it she goes scuba diving (brave, or stupid; I don’t know). She discovers a hatched egg and determines that the creature has a nest somewhere—with a whole hell of a lot more of the hungry little beasties. 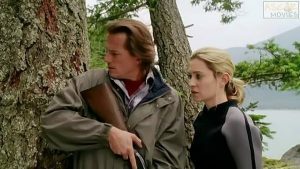 As the bite on Danny’s hand becomes more infected, they walk to the beach to look for a first-aid kit in the small craft that they used to reach the island. With the boat no longer there, and with the discovery of Erin’s mostly eaten corpse, they hurry back to the cabin, where they are attacked by a whole herd of the smaller creatures. They kill many of them and ultimately flee back into the woods, their goal an old abandoned ferry on the other side of the island. And that’s where I’ll leave you, just in case you want to check out this creature feature. Yes, Sea Beast is definitely a Guilty Pleasure. But as I’ve said before (many times), what’s wrong with that?